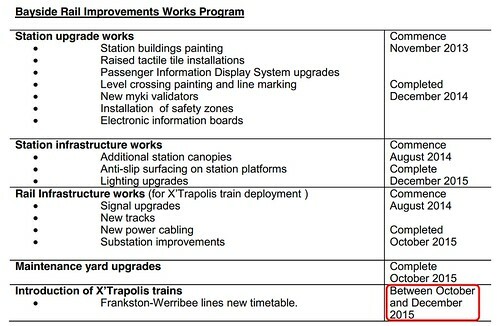 The Frankston line X’trapolis – are you impressed? You’d think from the tweets from Coalition MPs this morning that the arrival of the first X’trapolis train in service on the Frankston line was a miraculous huge leap forward for train travellers — a rocket-powered, laser-guided teleportation device that can get you to your destination in seconds. X’Trapolis trains are the newest, biggest and fastest trains on Melbourne’s network. Running this train on the Frankston line will reduce crowding and get more people out of their cars and onto public transport. The truth is a little more nuanced. So the claim is that these trains are bigger, faster, quieter and smoother. Bigger? I’m not sure of the logic behind that. The trains are a similar length, and with a similar number of seats to other models, and a similar total capacity. Faster? Perhaps — both the X’Trapolis and Siemens trains have theoretical speed limits of 130 kmh, but the Siemens is currently limited to 115, which is the same as the Comeng top speed. They have good acceleration, similar to the Siemens trains (1.2 m/s/s), and when I asked Metro’s CEO Andrew Lezala about it when the Bayside Rail Project was first announced, he said the overall speed was similar to the Siemens trains, presumably meaning if the entire line group went to X’trapolis and Siemens trains, they could theoretically speed up the timetable. And that, I suspect, is where the real, tangible benefit will be. Quieter? I’m not sure there’s that much in it. Smoother? Arguably not. 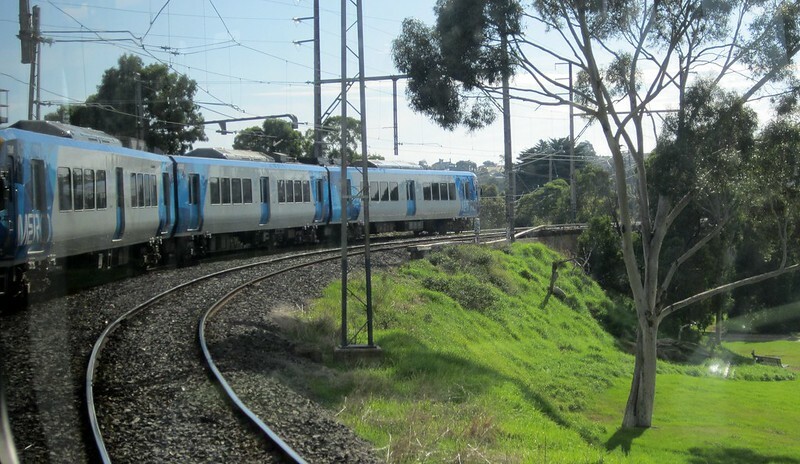 Many people have complained about the ride quality of the X’trapolis trains, though some of this is due to track conditions, especially on the outer semi-rural ends of the Hurstbridge, Lilydale and Belgrave lines. Some train drivers have complained of getting back problems. The newest X’trapolis trains do have very clear destination signs, and many more handles inside to hold onto if you can’t get a seat. They also have slightly fewer seats, making an arguably more efficient layout, allowing people to move in and out and around the carriage more easily. And they have big bold interior displays, though these are obscured by the handles! Clearly yes. The original estimate was that these trains wouldn’t start on the line until around October 2015. But of course, that’s well after the election, so they’ve brought it forward by an entire year. As noted by Channel 7 on Monday, and The Age on Tuesday, there is just one X’Trapolis train deployed onto the Frankston line. It has been specifically speed-limited so as not to accelerate towards still-closing boom gates too fast, and has two drivers in the cab as a precaution. The train seems to run just two round trips each morning, both timed to avoid the height of peak hour (so making poor use of the claimed additional capacity) before heading to sidings at Burnley for the rest of the day. So will people be impressed? It’s a publicity stunt, nothing more. Yet I know some people suffer from train envy — I remember a friend from the then Epping line saying he wished they got the Siemens trains. Perhaps he wouldn’t have wished that had he seen the often filthy state of the seats. But ask someone who regularly catches these trains if they’re anything special, and I doubt they’ll go over-the-top in praising them — they’ve had this model for years now. I suppose it’s good the politicians (who hold the purse strings) are so interested in public transport. But it’s important that the money isn’t all put into show ponies like “new” trains which aren’t really new, but into ensuring the whole system is frequent, reliable, fast, clean, and safe. Which type of train is which? Next → Next post: 10 minute trains – there is a rollout plan – but when will it get funded? The Metro chief implied that the driver’s cabin damage was an inside job – do you know anything about this? Not sure about the acceleration characteristics of the Xtrapolis fleet, but the maximum speed is 90 km/h against 95 km/h for Siemens and Comeng on the section Frankston-Mordialloc both exclusive, and an 80 (?) km/h curve at the north end of Kananook. Strangely the 0638 up from Frankston has the same intermediate section times as the 0650, maintaining a 12min-separation between the two all the way from Frankston to Flinders Street (55min), with the same stopping pattern. That would imply that the lower speed limit is counteracted by the short station spacing and the better acceleration characteristics. It’ll be interesting to see if the Xtrapolis manages to keep to schedule. I stand corrected – apparently there is an 80 km/h, then 90 km/h between Mordialloc and Aspendale, south side of the Mordialloc Creek. I prefer the X’Traps, but only because of the seat layout. I also prefer the old Hitachi’s compared to the Comengs and Siemann’s for the same reason. The Hitachi’s had much more comfortable seats, as well as a better layout in my opinion, although there were a few seats with very funny legroom on them. Really though, this isn’t a big announcement. Oh also Daniel, are you planning on doing a post regarding the absolutely wonderful advertising that Metro are gracing its customers with in the City Loop? I’ve just loved listening to them over and over as I wait ages for trains. @Roger, I’ve got no information on the vandal attack, but it underscores how silly this all is – there are something like 82 six car X’trapolis trains on the Melbourne network, but only that specific modified unit can run on the Frankston line, and only with multiple drivers aboard (thus it’s costing more money). Because that’s so different from any other train operating on the metro network how?! People really will believe anything. The claim that the X’trapolis trains are the fastest trains is also incorrect. Comengs and Siemens can do 115. X’trapolis are restricted to 90 due to braking issue at higher speeds. If that restriction gets lifted, they’ll be 115 like the others. Bigger, maybe, depends how you look at it. Slightly longer carriages, but less seats. Quieter, than a Comeng, but noisier than a Siemens. One of the best things about the Xtrap layout is the setback on the vestibule panels from the doorway. It means those passengers who choose to stand in the doorway don’t block ingress/egress as much – unlike the M>Train Comengs, which with the protruding grab-rails limit movement to only single file, not fun on crowded trains. Even the Siemens suffer a similar issues, mitigated only by their slightly wider doorways. While it would be nice to think doorway standees could be mitigated using behavioural modifiers, the ergonomics of the train furnishings help a lot. “yawn”…..all this interest in the Frankston line will obviously evaporate after the election. Perhaps we’ll be back to 50% cutbacks for the whole of January as happened this year? And that extra train at 6.33 am from Cheltenham….how often will it be cancelled after November? And Southland station doesn’t even make it to the works program list (altho still on the PTV site for 2015 commencement). Sorry, guys, but the issue here is all about credibility (or lack thereof). I was on a Comeng today travelling 120-125km/h on the express route between Newport and Laverton. Not sure where people are getting the maximum speed stats from, but I measured it for a good 2 minutes using my phone’s GPS and it never went below that mark. We left Newport on-time and got to Laverton on the dot too. Eventually, if a few X’traps are to run on the Frankston Line, then they’ll also have to do the Werribee Line. If they’re speed limited to 90km/h, I worry if it’ll be possibly to keep to the timetable when they’re running 30km/h slower than the other trains. Re:The Xtraps are speed limited because they are too quick for the level crossings? Would the signals not trigger when the train arrives at the platform, not as it is about to depart? If so, then would the train driver not be able to see the crossing, and be able to wait until he can see the crossing gates closed? In the viewpoint of a train buff, I think it is great. Great to see a train operating on more lines, and it would be great to have a line where we may in fact see all three types of train operate on. It may be handy having different trains on a line, given they each have their respective advantages to the same timetable. Xtraps are great when you have a high turnover at most stations, and is when you need the advantage of the quicker takeoff. That will always be a matter with specific trips and/or locations. Use Siemens trains on more express type runs. We are always having trains of which run late, because ‘trains can not keep up’ to the schedule. Timetables should never be done to expect 100% of the train on each run. The train needs to have ‘spare capacity’ so it can make up time should it start off late somewhere. Quicker trains; Only that they are quicker off the mark than the others. The trains are larger capacity, only because the trains have fewer seats than the Comeng trains, and I guess fewer seats than the Siemens trains too? I did catch somewhere that ‘doctors advise pregnant mothers to stay off the trains at around 8 months. The trains are just too rough for the safety of the baby. How was this set modified? Can it still run on other Xtrap lines? My understanding is that the two drivers are ‘driver training only’? using the train up to 4 times a day, usually multiple lines a week, I’ve seen all the trains and I know plenty about them. Living on the Frankston line, as soon as I found out what time the XTrap was running, I caught the second service from Highett-Frankston-Flinders (maybe a little extreme), really just to see how it would work (I’d heard about special breaking and concerns). It was fine, nothing special, if anything it felt a little high class and modern for little old Frankston, and made the ‘scenic’ journey a little fresher. The ride was bumpy (‘cheaper’ springs) and it still says ‘change for city-circle’ instead of ‘city loop’ at Richmond, but really, nothing special. I asked people about it, and not only did most of them not know there was a difference between train models, they really didn’t care. It seems like the only people with any interest in this project (and the word ‘X-Trapolis’) are the politicians hounding on about it. The people just want enough trains that get them to where they want to be. They don’t care which ones. If you want people’s vote, run MORE trains, not one ‘special’ train you had to chop and change to jam on the line months/a year early. I am not happy with the Xtrapolis on Frankston line. They blast the air con, all the ladies hair is blowing around, which shows it’s on too strong, the air vents are vertical on most other trains they are horizontal. Metro say they set all their trains to the same temperature, however when you change trains there is a noticeable difference. My journey is one hour long, twice a day, so I have legitimate reason to be frustrated by this. I wonder if any averaged sized Metro manager has actually sat on the first Xtrapolis from Frankston to the City lately. What an almighty con!!. Offer this product to Railways in the UK, France etc they would laugh in your face. See the Trains that Siemens are building for Thameslink, technically advanced trains, with Modern Real Time LCD Information screens and capable of 110 Mph in light and comfort. Xtraps do not even have air suspension. Ciled springs for goodness sakes. These Xtraps are pretty ordinary trains. Ponder this, who else run these trains. Valparaiso in Chile. Xtraps are bought because they are cheap. @Anthony, as you’re probably aware, the Frankston and Werribee lines are linked. It was never going to happen just after the election; the timeline in the post shows it was expected in October 2015. From what I understand it’s still expected to happen, but has been delayed by all the level crossing works as well as delays in implementing timetable changes.